At an altitude of 1.489m above sea level, Ba Na Hills is blessed with a mild climate all year round and beautiful natural scenery. This place has become one of the most attractive destinations in Danang. 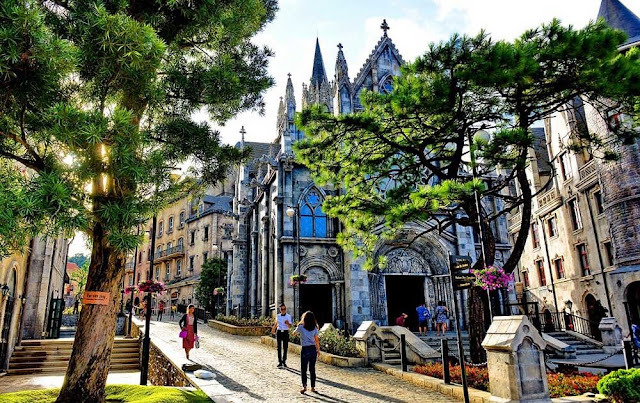 To visit the beautiful scenery, Ba Na entertainment venue, visitors can stay overnight at one of the hotels in Ba Na Hills Da Nang as following. Mercure Bana Hills French Village is a 4 star hotel of Accor Hotel Group. This is also the only hotel located on Ba Hills, a complex of resorts Ba Na Hills Resort Da Nang. The Mercure Bana Hills French Village has 494 tastefully and elegantly furnished European-style rooms. The hotel will provide visitors with a comfortable, classic and romantic living space "substance" French nineteenth century. According to the Mercure Bana Hills French Village and Ba Na Hills Da Nang tourism site, each room has a window overlooking the mountains or the old French Village nearby. Not only that, with the rooms located on high floors, visitors can also admire the panoramic space that poetic majesty of the "scene" Ba Na Hills. In addition, the Mercure Bana Hills French Village also offers a full range of high-end amenities including a bar, pastry restaurant, indoor swimming pool, spa, gym, convenience store. Bana Hills French Village, guests will have the most relaxing moments on Ba Hills - one of the most famous tourist spots in Danang. As a budget hotel, the price of each room at Mercure Bana Hills French Village is quite high. For the best rates, travelers can book accommodations at reputable online booking sites such as Agoda.com, Booking.com, or Tripadvisor.com. In the area around Ba Na Hills there are many hotels with good quality service. Outstanding at the Ebisu Onsen Resort is located at the foot of Ba Na Hills, in Hoa Phu Commune, Hoa Vang District, Da Nang. The Ebisu Onsen Resort is built on a hillside, each room has a beautiful view. The hotel has a total of 93 rooms, designed by the idea inspired by Hoi An ancient style architecture. The space is elegantly decorated, the old part of the room, feeling gentle, close. The special feature of the Ebisu Onsen Resort is the natural hot mineral water system that leads to the rooms. At the same time the bathtub in each room is made of natural stone monolithic, bathrooms are designed on the standard ONSEN. After a day of Danang tours, discover Ba Na Hills, when you are tired, you can soak in the hot tub and enjoy the most relaxing feeling. 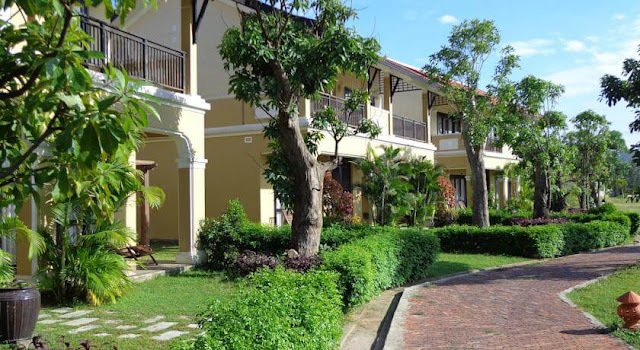 The Nature Villas & Resort Danang is one of the hotels just near Ba Na Hills which is located beside the Danang bay. It is in Nguyen Tat Thanh street, Lien Chieu district. Come to The Nature Villas & Resort, you can enjoy the mountain view poetry floating behind the white clouds, and can also watch the beautiful Da Nang Bay in the blue sky. The rooms of The Nature Villas & Resort Danang are designed and decorated in modern furniture style, with emphasis on simple beauty and sophistication. The hotel has a variety of rooms for visitors to choose from depending on their taste and needs. In addition, The Nature Villas & Resort Danang also has many high-level facilities such as swimming pool close to the sea, Spa, Gymnasium, tennis court, children's play area, café ... Especially Upon arrival at The Nature Villas & Resort Danang, guests can enjoy tasty delicacies made from fresh seafood caught in the hotel's two Ocean View and Red Beach restaurants. Besides the hotels in Ba Na Hills Da Nang on, near Ba Na Hills area, there are some hotels and guesthouses such as Hung Lam Hotel (497 Nguyen Luong Bang, Lien Chieu), Dong Phuong Hotel (93 Phan Chu Viet Hieu Hotel (41 Cao Son Phao, Cam Le District), Lang Viet Homestay (Phu Thuong Hamlet, Hoa Vang District), Lucky Bee Homestay (453 Kinh Duong Vuong, Lien Chieu District) ... 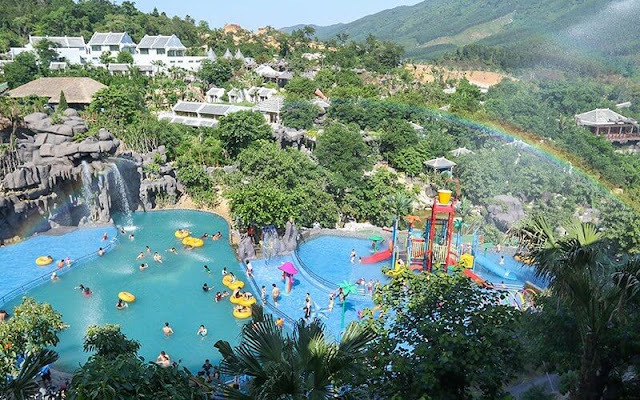 Check out the Ba Na Hills tourism experience in Danang for more information on this resort. We hope that the above sharing can provide more useful information for your trip to Ba Na Hills. Beyond Ba Na Hills, you can easily find more beautiful attractions, tours and services on our website: http://excursionvietnam.com/.